Although different regions experience different weather patterns, Egypt has an arid desert climate and is generally both hot and sunny. As part of the northern hemisphere, seasons in Egypt follow much the same pattern as in Europe and North America, with winter falling between November and January, and the peak summer months falling between June and August. Winters are generally mild, although temperatures can fall below 50 degrees Fahrenheit (10 degrees Celsius) at night. In the Western Desert, record lows have dipped below freezing during the winter months. Most regions have very little precipitation regardless of the season, although Cairo and areas of the Nile Delta may experience a few rainy days during winter. Summers can be unbearably hot, especially in the desert and other areas of the country's interior. In Cairo, average summer temperatures regularly exceed 86 degrees Fahrenheit (30 degrees Celsius), while the record high for Aswan, a popular tourist destination on the banks of the River Nile, is 124 degrees Fahrenheit (51 degrees Celsius). Summer temperatures remain high at the coast but are made more tolerable by regular cool breezes. The Egyptian capital has a hot desert climate; however, instead of being dry, its proximity to the Nile Delta and the coast can make the city exceptionally humid. June, July, and August are the hottest months with average temperatures of around 86 to 95 degrees Fahrenheit (30 to 35 degrees Celsius). Light, loose cotton clothing is highly recommended for those who choose to visit the city at this time, while sunscreen and copious amounts of water are essential. If you're planning a cruise down the River Nile, the weather forecast for Aswan or Luxor gives the best indication of what to expect. From June through August, temperatures regularly exceed 104 degrees Fahrenheit (40 degrees Celsius). 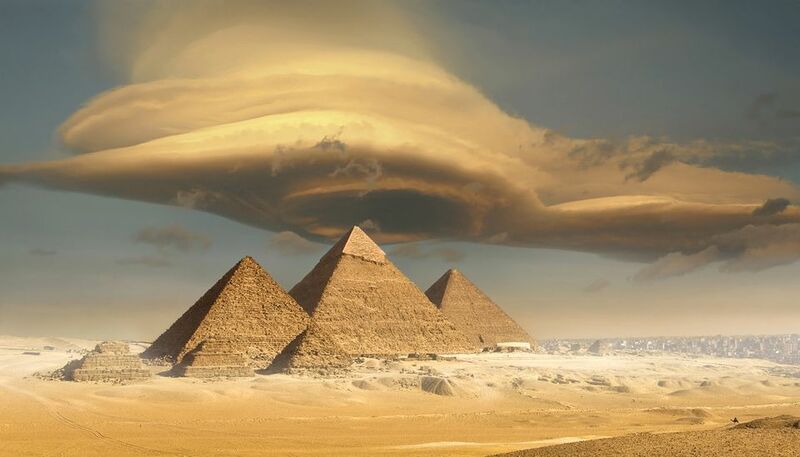 As a result, it's generally advisable to avoid these peak summer months, especially as there is little shade to be found near the area's ancient monuments, tombs, and pyramids. Humidity is low, and an average of over 3,800 hours of sunshine a year make Aswan one of the sunniest places on Earth. The coastal city of Hurghada gives a general idea of the weather at Egypt's Red Sea resorts. Compared to other destinations in Egypt, winters on the coast are generally milder, while the summer months are slightly cooler. With average summer temperatures of around 86 degrees Fahrenheit (30 degrees Celsius), Hurghada and other Red Sea destinations offer a respite from the sweltering heat of the interior. Sea temperatures are ideal for snorkeling and scuba diving, with a mean August temperature of 82 degrees Fahrenheit (28 degrees Celsius). If you're planning a trip to Siwa Oasis or anywhere else in Egypt's Western Desert region, a good time to visit is during early spring and late fall. At these times, you will avoid the searing temperatures of summer and the frigid nighttime temperatures of winter. The record high for Siwa is 118 degrees Fahrenheit (48 degrees Celsius), while temperatures can drop as low as 28 degrees Fahrenheit (2 degrees Celsius) in winter. From mid-March to April, the Western Desert is prone to sandstorms caused by the khamsin wind. Spring in Egypt can be everchanging. It's typically warm, but the season is known for strong winds which can cause sandstorms. These are most common outside of major cities and can sometimes last up to three days. While temperatures rise during March through May, humidity is very reasonable. What to pack: Regardless of the season you visit, sturdy walking shoes are a must. You'll also want to pack long pants and lightweight tops (both short- and long-sleeved) for a spring trip. Not surprisingly, summer in Egypt means oppressive heat and baking sun. Temperatures during the summer months average an impressive 104 degrees Fahrenheit (40 degrees Celsius) but can reach as high as 122 F (50 C). Even coastal areas stay warm, which is good for beachgoers—the water is typically a balmy 82 degrees Fahrenheit (28 degrees Celsius). The hottest period during summer spans July through September, so all but the most weather-hardened visitors should steer clear. What to pack: Keeping cool is the primary goal if you're visiting Egypt during the summer months. Pack lightweight cotton and linen clothing, but don't forget sunglasses and a wide-brimmed hat as well. Fall in Egypt brings in a massive influx of tourists. That's not surprising, given that the weather is nearly perfect. By the end of September, temperatures have dropped significantly. Most days average around 85 degrees Fahrenheit (29 degrees Celsius), but can vary a bit depending on location. This is a popular season, so expect price increases for hotels and other activities to increase accordingly. What to pack: Pack a light jacket, shirts for layering, and an umbrella—it can and does rain! Like other seasons, a brimmed hat and high-factor sunscreen is always a good idea. The winds in Egypt pick up during the winter season, but don't fret: Temperatures here still rarely drop below 50 degrees Fahrenheit (10 degrees Celsius). The beginning of December is a prime time to visit, as the sea is still quite warm, prices are low, and the worst of the winter winds likely haven't kicked up yet. Tourists also flock to the country during the third and fourth weeks of December, to celebrate Christmas and the New Year. What to pack: Winter in Egypt isn't as chilly as other locations, but a light jacket or windbreaker (there will be wind!) is a good idea. In general, even in winter, clothing should be lightweight and breathable.